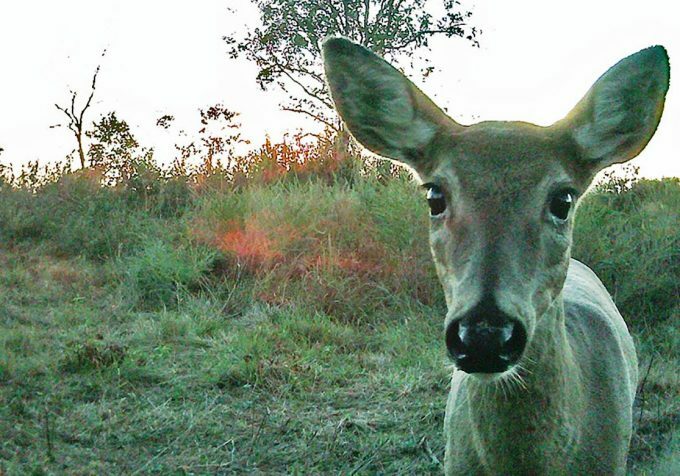 Trail cameras have become one of the most important tools for most hunters. It can able to survey the population of prey, do patterning and offer security to the owner as well. It is sometimes hard to recommend a certain camera model simply because there are a lot of available options everywhere, but Simmons trail cameras are a pretty decent camera that works efficiently for the game, as you will find in our Simmons trail camera review. Simmons Optics company has been around in the market for more than 30 years. 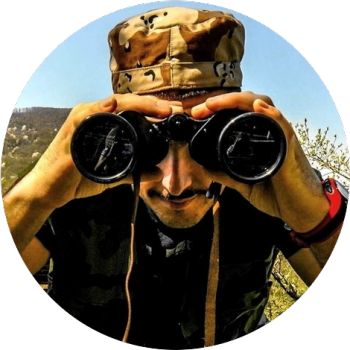 Their rifle scopes, binoculars, and trail cameras are known for providing the best optical experience. While offering value-priced optics, trail cameras like the one we’ll review today are capable of making hunting and other outdoor pursuits turn to the next level. With its compact size, ease of use and ultimate reliability, it is not hard to see why people love this gear the most. If you’re looking for something that offers more features than anything else, Simmons trail cameras might be the best fit. 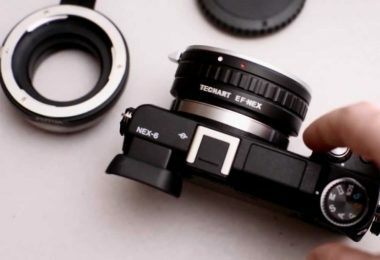 This review is designed to help you know what these cameras have to offer and what benefits you can get from such devices. The Simmons Whitetail trail camera is provided with various exceptional features and advantages in a way that other devices can’t offer. However, this piece of equipment also comes with some cons, just like other camera masterpieces, but they have always been outweighed by pros. A huge selection of different trail cameras these days can make your purchase decision even harder, so let’s go down to the basics and review Simmons Whitetail Trail Camera. In the box, you will find one Simmons Whitetail trail camera with night vision, and a wide 1-inch mounting strap with buckle all covered by the 1-year Limited Warranty. If you’re stated outside the US, the fact that Simmons doesn’t ship outside the US is one of the cons we mentioned above as there are lots of potential users out there who simply want to put their hands on this “little guy”. The device is placed in a well-sealed package offering a brand-new, unopened, unused and undamaged item. Since the camera is designed to work efficiently in capturing wildlife, it offers excellent packaging for all your wildlife monitoring. The design of the Simmons trail camera is fairly simple and straightforward. It has a compact casing which is designed with a tripod socket at the bottom. The front area reveals a USB port, SD card slot, and a battery compartment. The PIR motion sensor, camera lens, and infrared LED array can also be found at the front of the camera while a padlock hole for extra security is located on the side. The Simmons trail camera scores high in the design department as it is made uncluttered and very easy to use. Since this inexpensive trail camera is provided with excellent image quality, quick movement detection capability, great affordability, reliability and is easy to use it will not let you down in the competition. 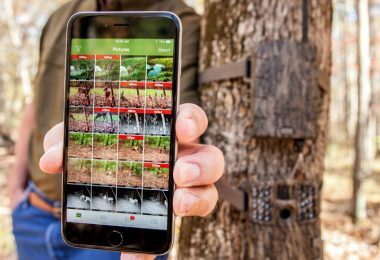 The Simmons trail camera does not just offer excellent camera features, affordable camera price but also straightforward camera functionalities. Whatever you will be doing on the field, this trail camera guarantees perfect day and night wildlife adventure. However, just like other products, this camera may degrade over time due to weather exposure and excessive use. It is important to take good care the product – clean, maintain and do not overuse it – so you can use its best to the fullest. Simmons cameras with night vision are one of the most affordable trail cameras in the market nowadays. It offers 100% quality materials, it has been tested extensively and is packed with beautiful design and lasting durability. Only a few cameras offering this great advantage in more or less $100 price range. The camera can be the most reliable hunting partner you will have as it is equipped with various gorgeous features such as the motion-activated sensor, infrared night vision LEDs, video mode and other high-quality attributes. The Simmons trail camera is designed to provide you great hunting and monitoring experience in amazingly great price. A Simmons Whitetail comes with a 1-year limited warranty in which the manufacturer is obliged to repair or replace the product. However, the warranty does not cover damages due to misuse or improper handling on the user’s end. Simmons camera is weatherproof which means you can use the unit no matter what the weather condition can be. However, you can’t use it underwater or place the camera under pretty heavy rainfall. You can use the device wherever or whenever you want, you just have to avoid abusing it. Overall, this device can be the most reliable hunting partner you can have. The image quality of the Simmons trail camera is excellent. As it has a 4MP high-quality full-color resolution, it takes quite excellent pictures. It offers 640×480 video day or night as well. Additionally, it has a quick trigger speed. A range of up to 25 feet is provided by its motion-activated sensor making it good for daytime or nighttime use. When you use it during the day, it captures clear and crisp images with plenty of contrast. As well as when you use it during the night, the camera captures excellent images with plenty of good contrast and detail. As it is provided with 15 low glow LEDs for infrared night vision at a 30 feet range, you can get high-quality images which are stamped with the date, time, moon phase and much more details. 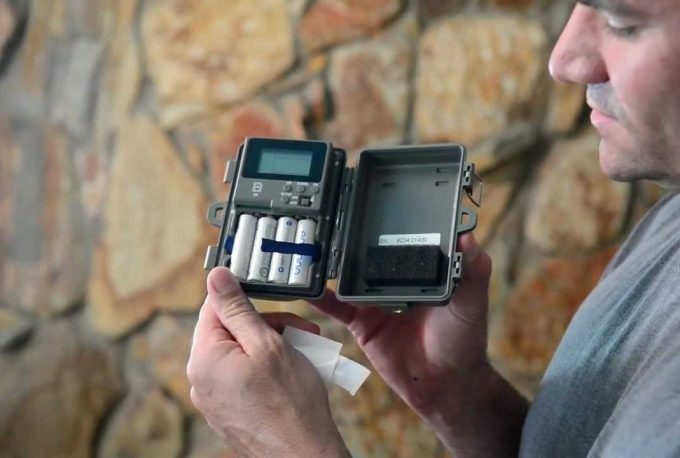 Simmons trail cameras are designed with an outstanding 6 months of battery life. It requires 4 AA batteries and up to a 32GB SD card. Though some cameras can operate for up to a year on a single set of lithium batteries, this does not mean you can’t depend on the camera at all. The camera is still a good blend of dependability and value. Since you can use the device 24/7 with infrared night vision LEDs, Simmons camera can be the best performing cameras on the market. When it comes to the easiness of use, the Simmons trail camera offers hassle-free accessibility without paying a lot. The device is provided with comprehensive and well-written user’s manual for beginners. If you do have an experience using a trail camera, you can easily use the device without that user’s manual. It has a menu that is easy to follow while offering a couple of ways to review and download your taken images. You can easily pull the SD card out for you to download the images, but you can also access the images by using the camera like a media storage device in which you are going to use the USB port on the side of the camera. Since there is no USB cable included, you need to purchase your own. 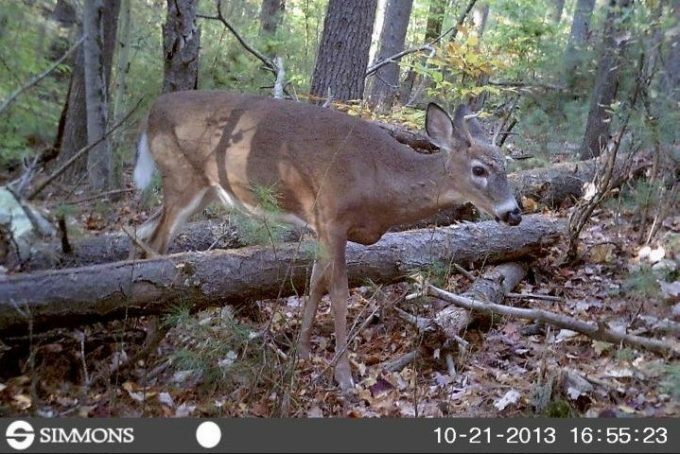 One unique feature of the Simmons trail camera is its ability to detect movement. The camera’s PIR sensor will detect movement of up to 30 feet away. However, this only applies to a larger game or human subjects. It means that if you want to capture smaller objects, it needs to be a lot closer to the action, something that is like 15 to 20 feet away. 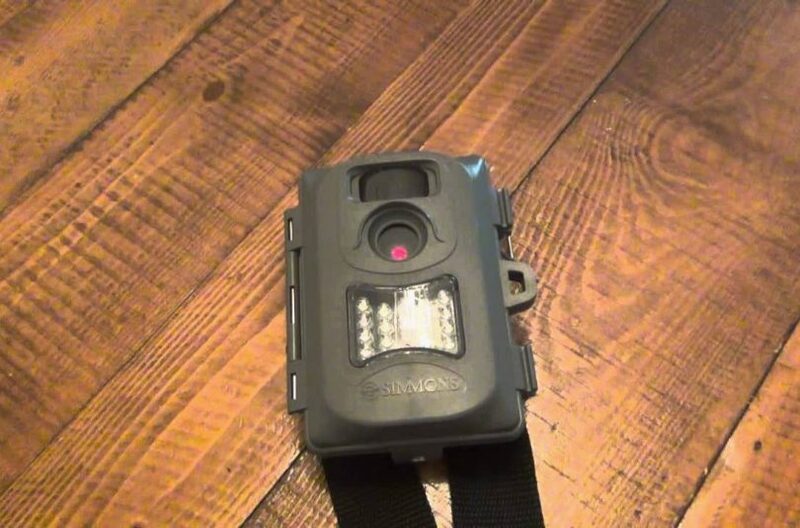 Other trail cameras only have 0.6 seconds trigger time but this one is offering 1.2 seconds trigger speed. 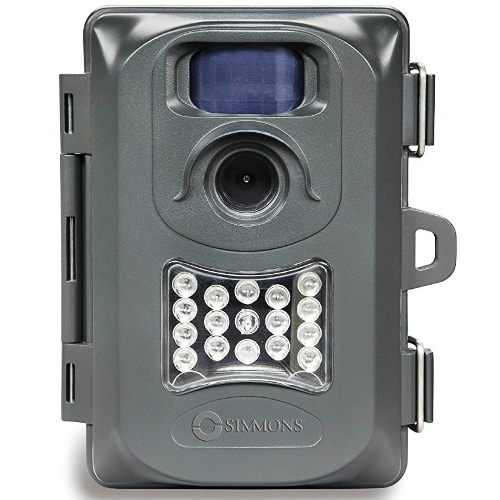 The Simmons trail camera is provided with still shots and video recording capabilities. Since Simmons camera is a fairly simple device, you can’t expect too much variety in its picture-taking modes. The camera offers a burst mode that will take three images at a time and allow users to set the quality of the images to different megapixels. Video taking is covered with 640×480 resolutions and is provided with 30 frames per second shoot. The number of pictures that the Simmons trail camera store depends entirely on the size of an SD card you insert into the camera. It depends on the quality of taken pictures as well. The camera does not ship with an SD card so you’ll have to buy your own for the pictures to be stored. Since the camera only supports up to 32GB SD cards, do not purchase a card that is above the limit. If you are using a 4MP camera mode, download the images at least once a week, especially if you take videos a lot to prevent storage or memory full. There are cameras out there that comprise almost all of the basic features the same as what Simmons Whitetail provides, so let’s have a look at similar products at the same price range. The latest Bushnell 8MP Trophy Cam comes with a comprehensive list of upgrades to boost its unmatched popularity. It has an incredible one-year battery life and quick 0.6-second trigger speed which help the device getting better ahead of the rest. The battery, however, varies with operating temperature and the number of photos being taken over time. The trigger interval is programmable. Unlike its past model, it now features a true HD video resolution and comes with the ability to record audio for stunning clarity and a more detailed result. This camera features high-quality 8MP full-color resolutions and the HD video covers 1280×720 pixels. It is provided with day and night sensor that detects automatically and a compatible external power. The addition of Hyper Night Vision is packed with no-glow black LED models which are available for absolute stealth. With it, you can expect brighter and sharper nighttime images, whatever outdoor pursuit you want to enjoy. The new Auto PIR automatically regulates as well to control sensitivity based on temperature so you can maximize consistency in all conditions. The Auto PIR is also an adjustable PIR in which you can adjust it from low, medium to high settings. With its multi-image mode, expect to get 1 to 3 images per trigger and expect to get a more detailed stamp on the images as the camera is provided with the addition of the GPS Geotag that automatically embeds each image for optimum tracking. Bushnell continues to lead the industry in providing high-performance optics for over 50 years. The company aims to provide the highest quality, reliable and most affordable sports optics that stand against other brands. When you purchase the Bushnell 8MP Trophy Cam, you will be able to capture thousands of images before the battery dies. Surely, that is something worth the money. When using the product make sure to use new AA alkaline or lithium batteries and make sure you are using a quality SD card for you to use the camera to the fullest. 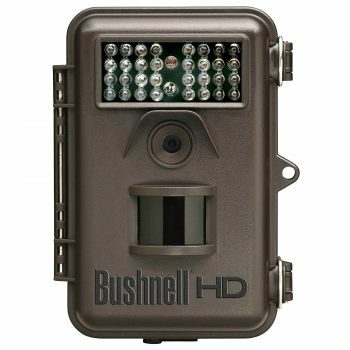 Just like the Simmons Whitetail Trail Cameras, Bushnell 8MP Trophy Cam also features up to a 32GB SD card capacity, night vision flashes, date/time, temp/moon stamp, LCD display and other similar features. One other similar product of Simmons Whitetail Trail Camera is the Crenova Game and Trail Camera. It can be found at approximately $200. The camera is designed with incredible HD images and videos to preserve every breathtaking moment of wildlife. It comes with stunning 1080P color images and superior sounding videos. It is equipped with a powerful 12MP resolution for you to discover the beauty and brilliance of nature without spending too much cash. 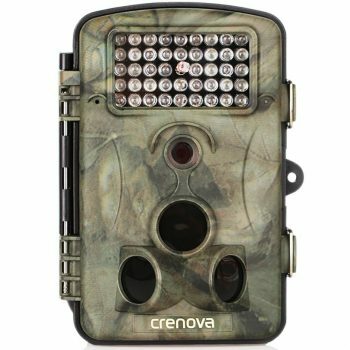 The Crenova Game and Trail Camera is provided with hyper trigger speed in a lightning fast way as it has 1-second trigger speed which will allow you to see the target with the widest viewing areas. The viewing area is up to 65 feet distance at 120° angle. The camera also offers easy-operating multifunction. This feature is essential to customize your needs while supports multi-shot, intervals, time switch and time lapses through the user-friendly system. Moreover, it offers a working time that is very much flexible. As you can preset the working time of the camera, you can use it anytime. The flexible working time also allows users to discover the unknown world of mysterious night-time species. You can extend the working time of the camera by connecting an AC adapter or a solar panel for a more lasting hunting experience. The time interval falls from 1 second to 60-minute range with 5, 8 and 12 megapixels. You can also imprint the images taken by the camera with time, date, temperature and location stamps. The product is designed to meet the demands of the users when it comes to hunting activities and is guaranteed with a 1-year warranty in which it offers 1-year replacement and refund. These advantages also come with dedicated customer service and professional technical support. Crenova Game and Trail Camera is also provided with an option to imprint images, high-definition images, sensitive auto PIR sensors and great audio recording quality the same with what Simmons Whitetail trail cameras with night vision capable of. 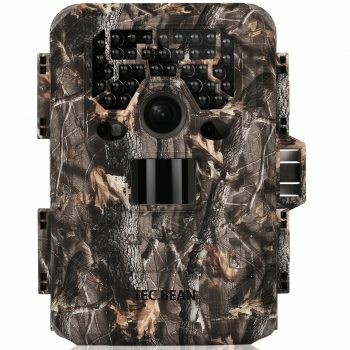 The TEC.BEAN HD Game & Trail Hunting Camera offers a bit less of a price than the Crenova Game and Trail Camera but comes with stunning features almost the same with what Simmons Whitetail trail cameras sports. It offers a 12MP high-quality full-color resolution with 1920×1080 HD video that is able to record up to 90 seconds audio. It also offers high trigger speed as it provides 0.6 to 0.8-second trigger capacity in which it covers 1 to 9 pictures per trigger. This is to make sure you won’t miss any action you’d love doing the most. This camera is also provided with long night vision range. It comes with Black IR LED which allows the camera to take full colored photos and videos during daytime and take black and white photos during night time. The images can be taken at up to 75 feet over 23 m distance while the videos can be taken at up to 10 feet over 3 m distance. One other great thing about the TEC.BEAN HD Game & Trail Hunting Camera is that it offers 5 capture modes (photo, video, time lapse, and Hybrid and motion detection) and panned motion freeze. This advanced motion detection technology works great for reptile and amphibian surveillance. 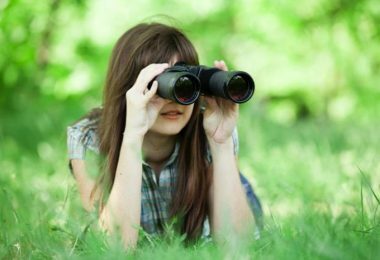 You can use these modes for different observation and it will give you much more convenience in hunting. This camera provides 2-level protection as it has been IP66 high waterproof certified to protect the device from water, moist, sand, corrosion and dust from coming in. Another protection the device has offered is that it requires password setup to properly secure the camera. Moreover, the device exactly shows the data in the photo or video being taken such as GPS Geotag, moon phase, camera ID, temperature, time and more. This feature has been designed to offer you a more accurate object observation. Some features that make this camera similar to Simmons Whitetail trail cameras with night vision include LCD display, a sensitive image sensor, up to 32GB SD card capability, high trigger speed, type of batteries required and more. Simmons Whitetail trail camera offers a lot of distinctive features and advantages at its price range. It provides a powerful resolution as it is equipped with 4MP camera advantages to giving exceptionally clear focus and image quality. The camera is very easy to set up. You don’t necessarily need to carry a user’s manual every time you go to work with it. Additionally, the device is provided with motion activated sensor or Motion Activated PIR. This will help users capture great images and videos even if the object is moving. Since this camera is equipped with long-lasting battery life, you can able to capture various audio, video or photo records before the battery retires. It is also provided with infrared night vision enabling users to get the perfect shot while the target feels safe under the cloak of darkness. Stamped photos and expandable memory the camera has offered are other great things to consider in this kind of hunting equipment. Simmons Whitetail trail cameras with night vision is a budget-friendly camera packed with full features and advantages over another brand. You can bring it anywhere without having to carry a user’s manual all the time as it is lightweight and compact. This camera is ultimately great for day and night use with excellent image quality, expandable memory, and long-lasting battery life. Simmons has been established in 1983 and is continuing to provide a wide range of innovative, affordable and high-quality optics for a wide variety of uses. Simmons Whitetail trail cameras with night vision are one of the most budget-friendly trail cameras in the market today. It has been packed with nearly all of the features you expect to be found on more expensive models. With years of research and innovation, Simmons offers exceptional Whitetail trail cameras to make hunting and other activities a memorable experience. Now we’d love to hear from you. If you have any experience with this or any of our other trail camera picks, please leave a note in the comment section below.